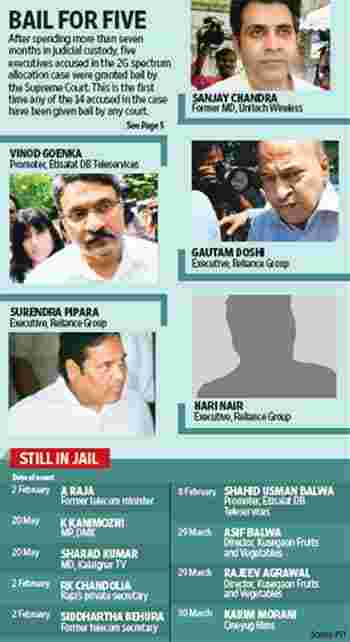 New Delhi: Five business executives accused in the second-generation (2G) telecom spectrum case were granted bail by the Supreme Court on Wednesday after spending seven months in judicial custody. It marked the first time any of the 14 people accused in the case, which relates to alleged irregularities in the allotment of 2G spectrum and licences, have been granted bail by any court. The special court where the trial is proceeding and the Delhi high court had previously denied them bail. On 20 June, the Supreme Court also rejected the bail pleas of member of Parliament K. Kanimozhi, Kalaignar TV’s Sharad Kumar and others. Celebrations broke out in the trial court as news of the Supreme Court ruling came in, interrupting the trial and forcing the court to adjourn briefly. “The family members, relatives and other outsiders created a ruckus in the court and they were repeatedly advised not to do so," special judge O.P. Saini noted. 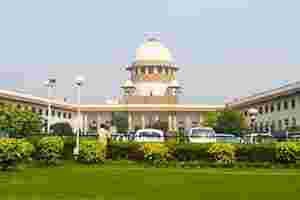 In a 59-page ruling, the Supreme Court noted that charges had been framed and the Central Bureau of Investigation (CBI) probe of the five executives’ role in the case was over. The bench, comprising justices Ganpat Singh Singhvi and H.L. Dattu, ruled that “the reasoning adopted by the learned district judge, which is affirmed by the high court, in our opinion, (is) a denial of the whole basis of our system of law and normal rule of bail system". “The law of bail today in this court is in shambles. I’m not exaggerating when I say that bail jurisprudence has been subverted," Jethmalani told the court. The court heard his lengthy arguments and eventually agreed. “From the earliest times, it was appreciated that detention in custody pending completion of trial could be a cause of great hardship. In the instant case, as we have already noticed that the ‘pointing finger of accusation’ against the appellants is ‘the seriousness of the charge’," the bench said on Wednesday. “Though they (CBI) contend that there is a possibility of the appellants tampering witnesses, they have not placed any material in support of the allegation," the court said. Goenka, Chandra, Doshi, Nair and Pipara, who were arrested on 2 April, when the CBI filed its first chargesheet before the special court, were released after executing two sureties of Rs5 lakh each. The court laid out conditions for their bail: they will not try to influence witnesses or tamper with evidence, they will cooperate and be present in the trial court whenever necessary, their passports will have to be surrendered, they will not deny that they are accused in this case, and finally, if the CBI finds that any of them are misusing their liberty, it can approach the Supreme Court to seek their arrest. Kanimozhi, Sharad Kumar, Hindi film producer Karim Morani and two others applied to the Delhi high court for an early hearing of their bail pleas in the wake of the Supreme Court ruling. The high court has listed their case for 1 December. Their applications will be heard on Thursday. Meanwhile, the Delhi high court on Wednesday suspended its order to shift the 2G trial proceedings from Patiala House courts to the Tihar Jail court complex, issued a day earlier. The court constituted a new committee comprising the district judge in charge of Patiala House, the registrar general of the Delhi high court and the 2G defence counsel to explore suitable options for the venue of the trial. Lawyers have repeatedly asked for a larger courtroom for the trial.